Add nautical flair to your driveway or landscaping with the Panacea Triple Wave Border Fence. Three angled scrolls occupy the center of this panel, reminiscent of ocean waves. A horizontal rod rests above and below the center detail, for support and style. The top of the item has a double upward arch with inward scrolls, furthering the theme. Eyehooks on one end of the panel accommodate tabs on the opposite end of another panel, helping them interlock to create a sturdy fence. The brown tones enhance any surrounding, while the round rods add a delicate look. Steel construction and a powder coated finish provide durability to the item, for several seasons of use. 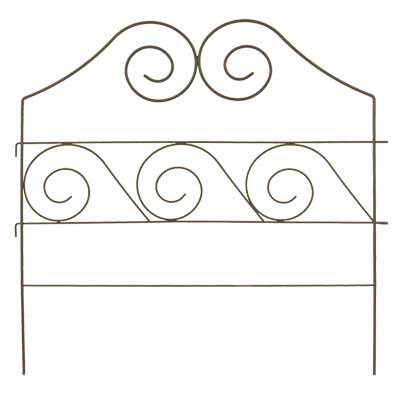 Bring a hint of the sea to your garden with this Triple Wave Border Fence. Note: This case pack includes 12 of the Panacea Triple Wave Border Fence Sections.